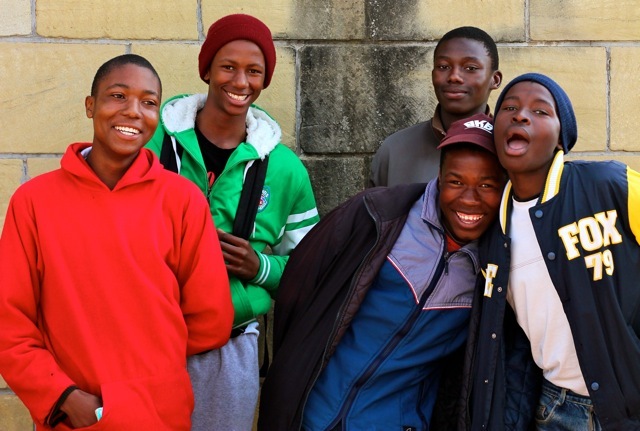 Youth gained greater access to voluntary medical male circumcision as comprehensive HIV prevention services were brought closer to the community. Mohale’s Hoek, Lesotho—With his yellow health booklet in his hand, Tsepo Lethole waited excitedly for the minibus that would take him to the health center and the HIV prevention services now available to young men. He stood in the same spot where, only days before, Ministry of Health (MOH) officials had explained to his father and other village men and women the benefits of voluntary medical male circumcision (VMMC) as part of a package of comprehensive health services. After the community education session, his father had gone to the health center to sign a consent form allowing the health workers to offer his son VMMC services. In anticipation of the “big day,” Tsepo woke up very early to wait for the transport to take him to the Mpharane Health Center. Transport, organized by Jhpiego, took him and his peers to and from the health center to ensure that students could access the services. Once Tsepo arrived at the clinic, he joined a group education session that reinforced the benefits and risks of medical circumcision. A Jhpiego-trained provider explained the steps Tsepo would have to take, emphasizing that VMMC is only partially protective and that Tsepo would need to take additional measures to protect himself from HIV. As part of a comprehensive package of services, Tsepo received information about HIV counseling and testing, condom use and screening for sexually transmitted infections. The Mpharane Health Center is about 20 kilometers from Ntšekhe Hospital, where the services have been provided since 2013. In July 2014, the MOH decided that during the high-demand season, services would run concurrently at hospitals and selected health centers to serve those clients who would not, for one reason or another, get to the district hospitals for services. During that month, Mpharane Health Center contributed to 56 percent of the 343 circumcisions conducted in the district. The MOH, supported by the President’s Emergency Plan for AIDS Relief through the United States Agency for International Development, has been implementing VMMC services in Lesotho since February 2012 as part of the country’s HIV prevention strategy. Since then, 17 district hospitals and several private medical facilities have been offering VMMC clinic days at least twice a week throughout the year. The services have been well-received by Basotho men, as evidenced by the overwhelming demand, especially during the winter season. Between February 2012 and December 2014, 79,291 circumcisions were performed through this partnership. In Lesotho, HIV prevalence remains high despite considerable levels of awareness. Lesotho has one of the highest HIV prevalence rates in the world, with an estimated 23 percent of adults infected. New infections number about 26,000 a year. VMMC is therefore an important HIV prevention strategy to curb the epidemic. The decision to offer VMMC services at both hospitals and health centers has enabled a great number of clients in hard-to-reach areas to access VMMC services in 2014. Reaching these marginalized communities with a proven HIV prevention intervention is critical to achieving the government of Lesotho’s objective of reducing the number of new HIV infections among men.